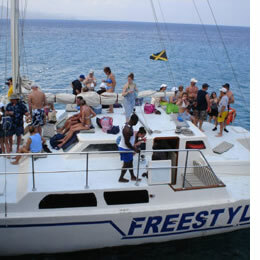 Join us for a 'Freestyle Sailing Experience'. Depart at the Cruise Ship Pier and Sail the beautiful clear blue waters of the Caribbean Sea to the Snorkeling location inside Jamaica's National Marine Park, on the shores of Montego Bay. Mask and snorkel are provided to assist with the viewing the wonderful Underworld of the Marine Park. When snorkeling and swimming are completed the Rum punch will start to flow. Learn the latest Jamaican Dance Moves or relax with a Foot Massage. Join in and move your feet to the Jamaican Reggae Beat. The party continues with a short stop at Margueritaville's Party. (20 min. stop 'weather permitting'). Take a ride on the slide. 'Ready we are Ready' at the sound of the 'Conch Shell' don't miss the Boat! Feel the Beat, move your Feet to the Reggae Beat. Sail to the Ship Pier is approx. 20 mins.